How to book a charter bus rental for your special day! We know. Wedding transportation isn’t the most exciting element of wedding planning. It’s no cake tasting or dress fitting, but, with the help of this guide, it can be quick and painless. And who knows? Maybe we’ll surprise you with some playful ideas to make your bus part of the fun. To avoid the price surging that occurs with last minute bus rentals, rent your wedding shuttle bus no later than 4 months in advance. 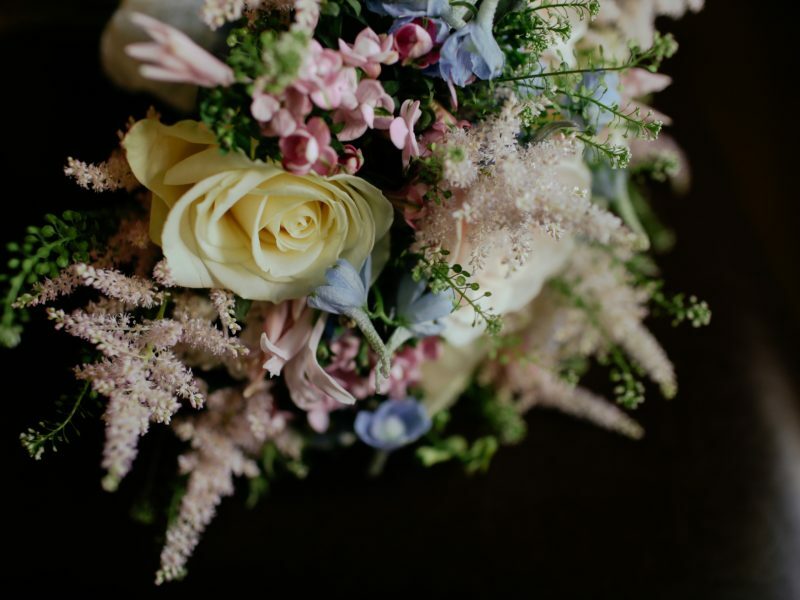 If your special day is scheduled any time between April and June, you’ll be competing with prom and graduation. So book even earlier! Bus.com makes it easy to book your bus as early as possible. When you have your date, best-guess-guest-list, and locations, get a quote with our online booking tool. Our Book Now, Pay Later option lets you book your wedding transportation, then wait to pay until 21 days before your big day. 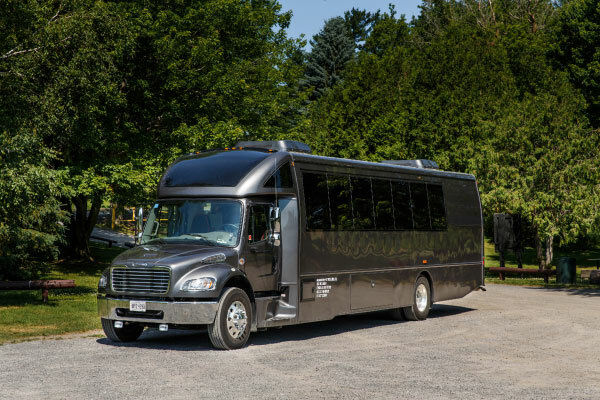 What type of bus should I rent for my wedding shuttle bus? The coach bus is the cream of the bus rental crop. All the amenities are available on coach bus rentals (sometimes for a small fee). 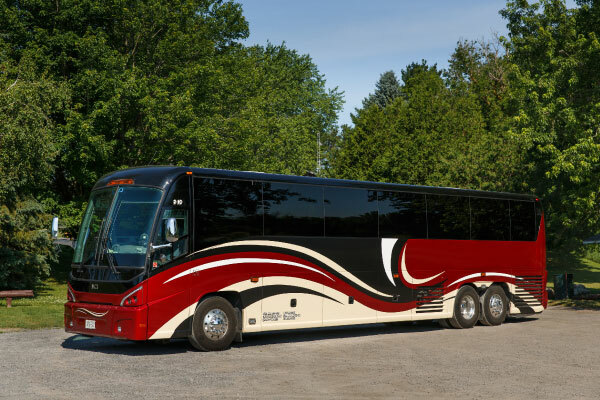 You can get A/V equipment, more comfortable seats, air conditioning, power outlets, and wifi with a coach bus rental. It screams VIP! Insider tip: The largest element of your wedding bus rental cost is the driver’s time, so the price difference between a coach bus and the school bus is slim. There’s just something about a school bus that makes people smile. It’s perfect for wedding photo memories! The school bus might be plain, but it’s great for transporting large groups short distances. 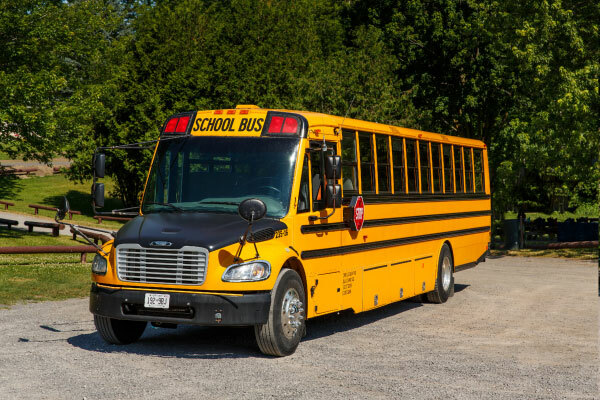 We recommend renting the school bus for wedding shuttle services between the ceremony and reception venues. Wedding planner tip: Organize a sing-a-long of all your favorite love songs to get your guests in the mood to celebrate the newlyweds. For wedding party transportation, the mini coach bus is a cost-effective and practical alternative to the stretch limo. The average limo holds between 6 and 10 passengers. That’s fewer than the average wedding party when you include the groomsmen, bridesmaids, parents, flower kids, ring bearers, and photographer. Mini coach buses will hold up to 20 passengers! “Awwww” tip: Decorate your mini coach bus with flowers to make it extra photogenic. Cute, petite, and extra sweet! The minibus is a lot of fun packed into a mini package. If you’re picking up guests from the hotel, use a minibus rental to shuttle your wedding guests to the ceremony. You can use one minibus with scheduled trips from different hotels, or plan multiple rides from the same hotel, providing your guests with different departure options. Fun tip: Play Newlyweds Trivia. Think up some questions about the couple’s love story and quiz your guests. The winners on every ride can take home a centerpiece from the reception. A little extra goes a long way! Depending on the type of bus you choose, different amenities will be available. Some of these will be vital. Some will be nice little luxuries. The number one thing that gets forgotten in wedding planning is the massive poofy skirt. Limos are nice, but made uncomfortable when they’re packed full of taffeta. The extra space and comfortable seats of a coach bus are key to crammin’ in that princess dress. You’ll also want to consider booking a wedding bus rental with air conditioning so that guests wearing pastel will arrive pit-stain-free. Wifi, audio-visual equipment, on-board bathrooms, and extra luggage space are also available on most coach buses. Style your wedding bus rental to suit your vibe. Every bride is different. Some are girly. Some are rock-and-roll. Whoever the belle of the ball may be, you can style your bus to suit her vibe. When planning floral arrangements, consider getting a few extra bouquets to spruce up the bus. Streamers in pretty pastels or a few well-placed palm leaves can bring extra life to your wedding transportation. Purchase photo booth props and leave them in the seats to encourage guests to explore their playful sides…and create some memorable moments to capture in pictures. Beyond the wedding shuttle bus: Ideas for making the most of your wedding bus rental. Plan hotel pickup for your guests, either from one hotel or from several hotels close to your venue. Some hotels offer shuttle services, but they are limited and dependent on the hotel’s schedule. You might also end up sitting next to a hotel guest who is not part of the wedding. For extra privacy and versatility, plan a hotel shuttle with your own chartered wedding bus rental. All charter bus rentals come with an experienced and vetted driver. One of the benefits to having a personal chauffeur is you can be sure your guests will get to bed safely. Organize a few scheduled departures at regular intervals to take your guests back to their hotels. Post the schedule on your wedding website and near the venue’s exits. Give your guests the full VIP experience by taking care of the whole weekend’s worth of wedding transportation. Get your groggy guests to the Sunday brunch, take the bridal party to a spa, or plan transportation for the Friday BBQ. Your out-of-town family and friends will thank you. Decide where your wedding bus rental will pick up and drop off your guests. Select the hotels from which you would like to provide transportation. Try and keep it simple by booking blocks of rooms at only two or three hotels. Step 2: Nail down the schedule. Write out when the ceremony begins, when the reception begins, and when the evening ends. 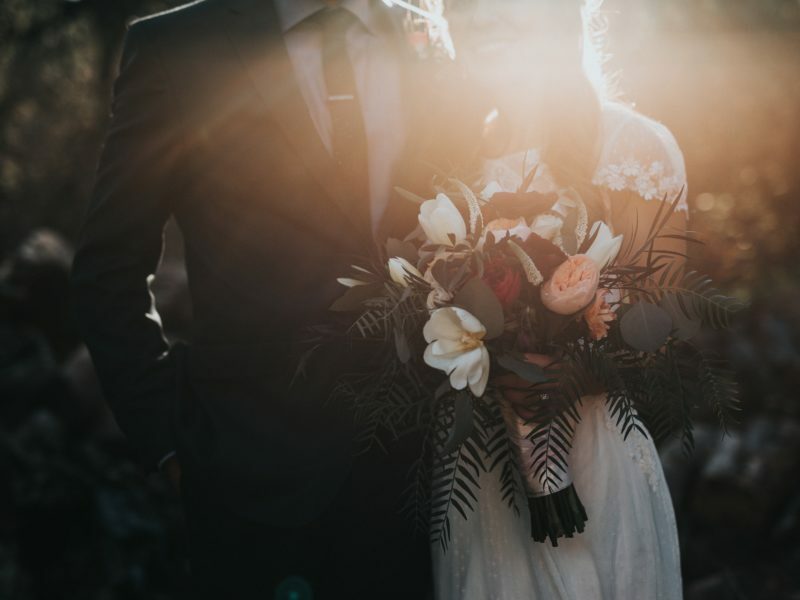 Consider when and where you would like to take your wedding photos, at what time you will do hair and makeup, and if you’d like the newlyweds to make a grand exit. Get on Google Maps and start timing out the travel. How long is it going to take your guests to get from point A to point B? Will your bus need to make multiple stops? How long will it take your guests to board? Create a document with your itinerary and the time it will take to make each trip. Now, add 15 minutes to every bus trip. This will account for sudden downpours, surprise construction, and late groomsmen. Create your itinerary online. Either use a Google Doc or a Google Sheet. You could even upload the information to your wedding website so that guests can access it on the go. It is especially important to provide your driver with a printed copy of the itinerary. Go full Type A and include maps of your preferred routes, keeping in mind that unforeseen circumstances might force your driver to take another route. 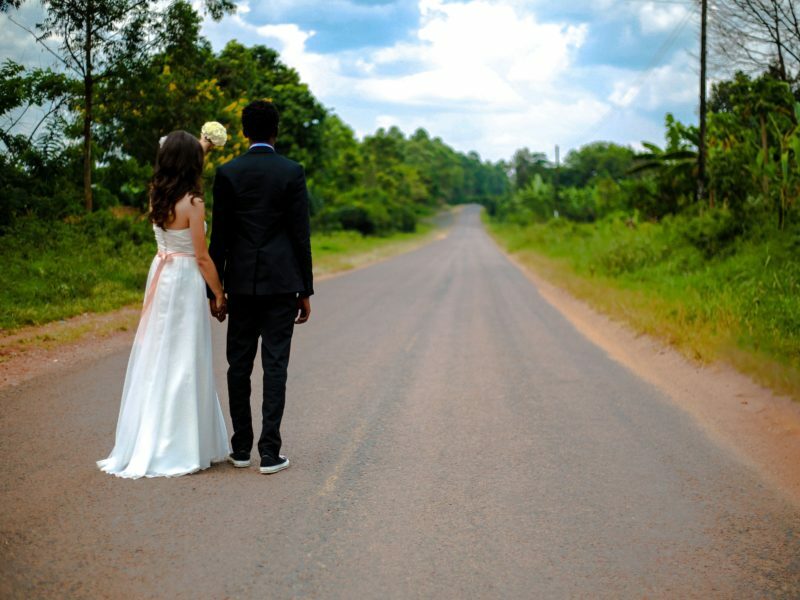 Ready to start planning wedding transportation? Use our online booking tool to get a quote. A reminder: You can reserve your bus and wait to pay until 21 days before departure. And, if you have any questions, our booking specialists are happy to help.